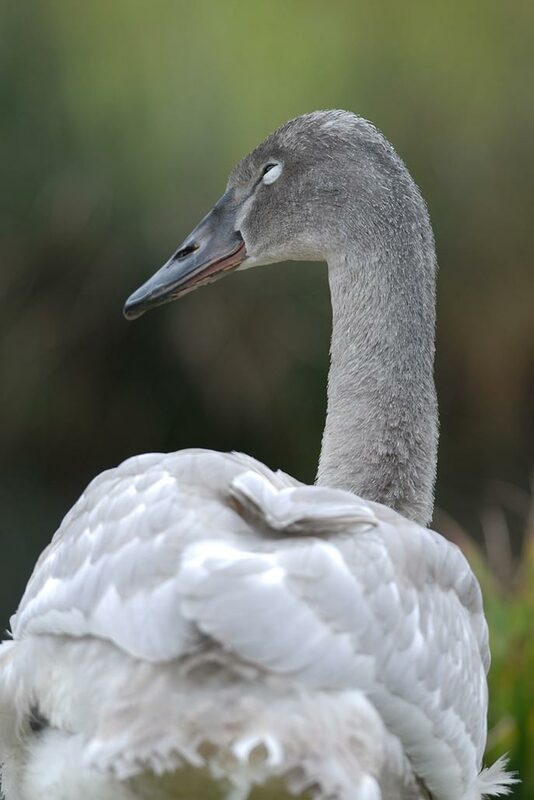 The Trumpeter Swan is the largest of all North American swan species, growing up to 1587mm long and 13.6kg (Mitchell & Eichholz 2010). Adults have white plumage with a characteristically long, heavy, wedge-shaped bill that is completely black. It is a long-necked bird, with short black legs set well back on body. 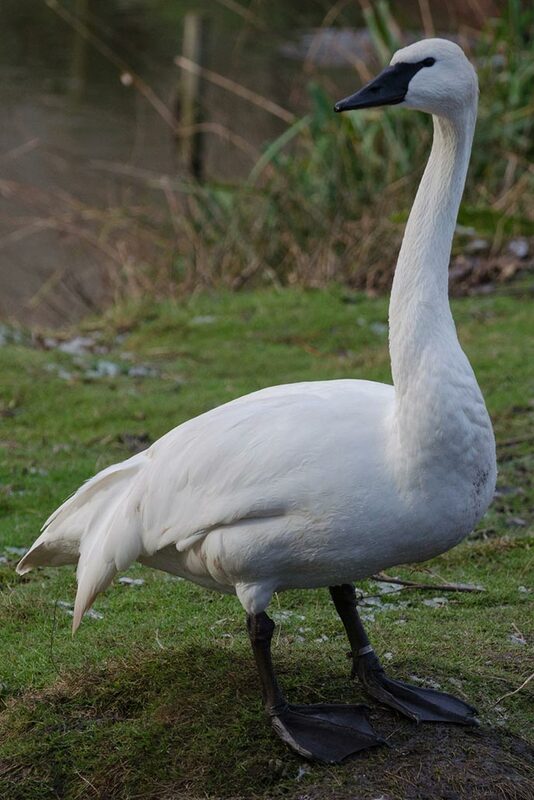 It is commonly confused in the field with the smaller Tundra (Whistling) Swan (C. columbianus), but is distinguished by its greater size, and wedge-shaped, black bill with no traces of yellow near the eye. Tundra Swans also have a more rounded head in profile, and a comparatively slender, concave bill. Cygnets are usually pale grey in colour, with darker areas on the rump, shoulder and nape of neck. In some populations leucism is common (Mitchell & Eichholz 2010). The bill is mainly pink at hatching, becoming greyish pink at the base and edge of the bill. Legs are feet range from orange to pinkish grey to black during the first year (Nelson 1976). Trumpeters have a very deep call from which its name is derived. Vocalizations vary with social context, loud open-mouthed calls associated with aggressive encounters and Triumph display, whereas softer, more nasal contact calls used to maintain family cohesion. Young birds make high pitched calls, developing their more basal tones at 6-8 months (Banko 1960). Adult Trumpeters wing moult occurs during June-September for 30-40 days each year. Paired birds tend to moult asynchronously (Mitchell & Eichholz 2010). Historically widespread, breeding over a wide area from central Alaska across Canada to Newfoundland, and south to Carolinas in eastern US, and to Idaho, Oregon, and perhaps California in the west. The wintering range equally extensive, ranging from southern Alaska to southern California, central Florida and Gulf of Mexico (Texas, Louisiana) (Banko 1960; Mitchell & Eichholz 2010). Pacific Coast population: This population breeds predominantly in Alaska and winters from Southern Alaska down to Washington,Oregon and California. Rocky Mountain Population: This population breeds in parts of Canada and Northwestern USA (Montana, Wyoming, Idaho, Oregon, Washington, Nevada). Most of these swans winter not far from where they breed with some migrating farther south. Interior population: This population consist of restored flocks in North-central and Eastern USA and Eastern Canada (South Dakota, North Dakota, Nebraska, Minnesota, Wisconsin, Iowa, Michigan, Ohio, New York, Ontario). 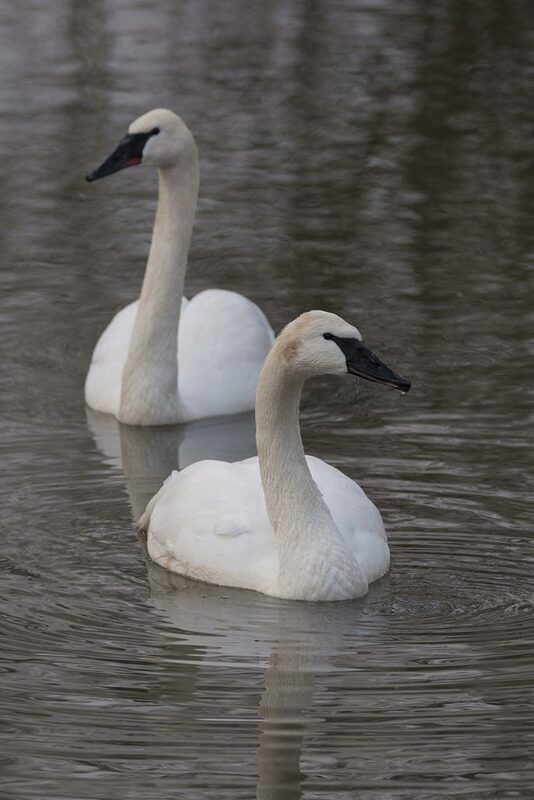 Many of these swans winter not far from where they nest, but some are beginning to migrate south and winter in historic wintering areas such as the Chesapeake Bay and the Gulf Coast. Uses a wide range of habitats in both summer and winter, but nests mainly in fresh water marshes with abundant invertebrates and submerged aquatic vegetation (Banko 1960; Lockman et al. 1987; Squires 1991; Mitchell & Eichholz 2014). Breeds mainly in or surrounded by water, and nesting density is variable. The Trumpeter will use larger marshes and lakes during migration, preferring ice-free areas where feeding is possible (Gale et al. 1987). Habitat in winter is very much dependant on this need to find available ice-free water areas (Mitchell & Eichholz 2010). Passage of the Migratory Bird Treaty Act of 1918 in the USA and the Migratory Birds Convention Act in Canada helped curb illegal killing (Robert Savannah). Severe weather events may cause high mortality (Mitchell & Eichholz 2010). Habitat loss or alteration (BirdLife International 2012). Lead poisoning in localised areas is also responsible for high mortality. Illegal harvest during Tundra Swan hunting seasons may result in pioneering individuals being selected against. Banko,W.E. (1960). 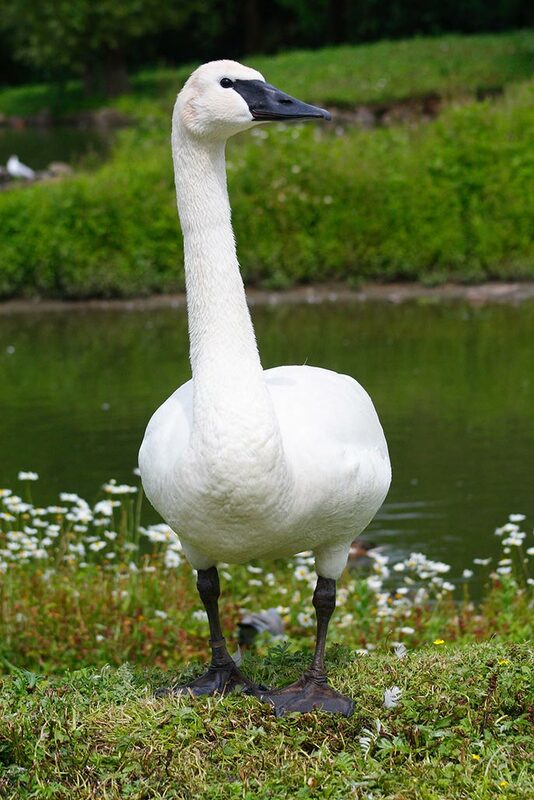 The Trumpeter Swan. Its history, habits, and population in the United States, N.American Fauna, No. 63. US Fish & Wildl. Serv.,Washington. BirdLife International (2012). Cygnus buccinator. The IUCN Red List of Threatened Species 2012. Available from: http://www.iucnredlist.org/details/full/22679859/0#end_uses [Accessed Feb 2018]. Gale, R.S., Garton, E.O. and Ball, I.J. (1987). The history, ecology, and management of the Rocky Mountain population of Trumpeter Swans. US Fish & Wildlife Service, Montana Cooperative Wildlife Research Unit, Missoula, MT, USA. Groves, D.J. 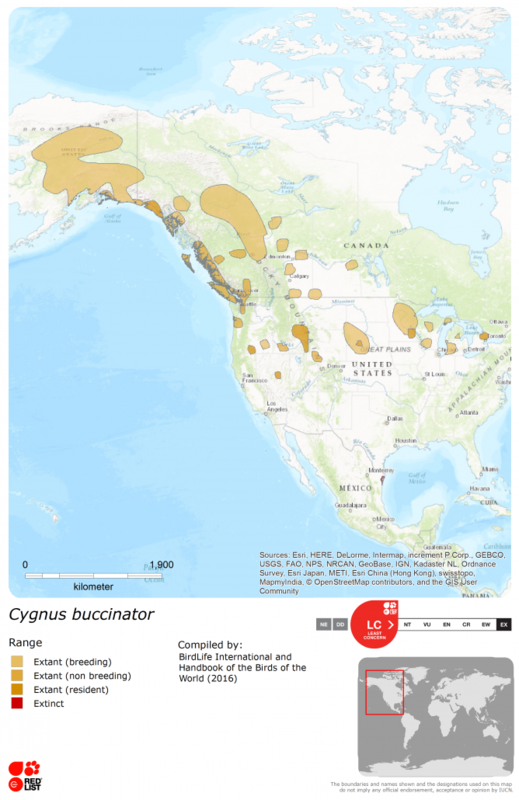 (2017) The 2015 North American Swan Survey. A Cooperative North American Survey. U.S. Fish and Wildlife Service, Office of Migratory Bird Management, Juneau, AK, USA. 26 pp. Kear, J. (2005) Ducks, geese and swans volume 1: general chapters; species accounts (Anhima to Salvadorina). Oxford University Press, Oxford, U.K.
Lockman, D.C.,Wood, R., Burgess, H., Burgess, R. and Smith, H. (1987). Rocky Mountain Trumpeter Swan population.Wyoming flock. 1982–1986.Wyoming Game and Fish Dept., Cheyenne. Mitchell, C.D. and M.W. Eichholz. (2010). Trumpeter Swan (Cygnus buccinator). The Birds of North America, No. 105 (ed. A. Poole and F. Gill). American Ornithologists Union, Washington, D.C. and Academy of Natural Sciences, Philadelphia, PA, USA. Revised. Nelson, C.H. (1976). A key to downy cygnets with analysis of plumage characters. Wilson Bull. 88: 4–15. Robert Savannah (no date). Trumpeter swan (Olor buccinators). 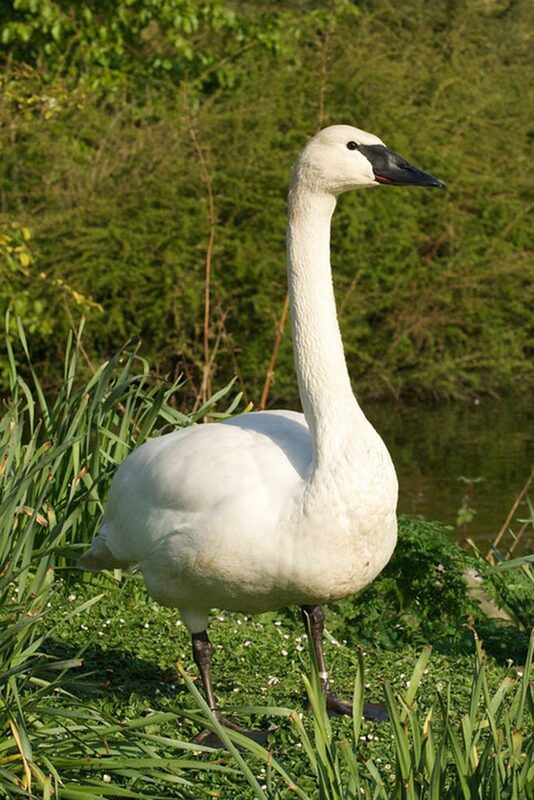 Available from: http://www.fws.gov/species/species_accounts/bio_swan.html. [Accessed Feb 2018]. Squires, J.R. (1991). 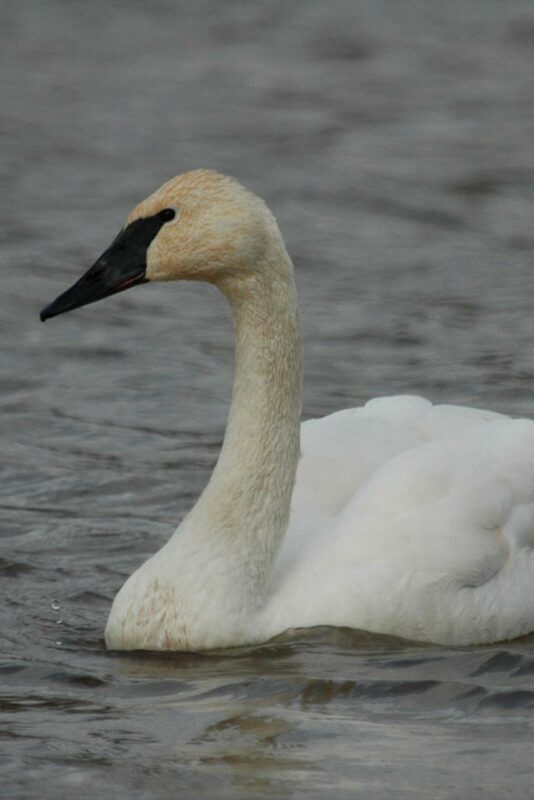 Trumpeter Swan food habits, forage processing, activities and habitat use. Unpubl. Ph.D. thesis. Univ.Wyoming, Laramie, US.